He’s not bad, and that’s part of the dilemma. The Bucs don’t quite know what to do with Donovan Smith, who ranks somewhere near the middle of the pack among NFL left tackles. Smith, 25, aces the board in terms of durability. He hasn’t missed a start through four NFL seasons, since the Bucs selected him out of Penn State with the 34th overall pick in 2015 to protect Jameis Winston’s blind side. And now, with unrestricted free agency looming for Smith, Bruce Arians and Jason Licht must decide whether this guy’s a keeper. Durability is important, but if it’s a player’s No. 1 attribute, that’s a problem. Nobody questions Smith’s toughness and pride. When he suffered a knee sprain in practice last August, Smith was expected to miss 2-4 weeks. It was uncertain whether he would be ready for the season opener in New Orleans. He was, and he played well as Tampa Bay won in a shocking shootout. Availability is not the question when it comes to Donovan Cole Smith. He’s going to line up every week and give you what he’s got, but is that good enough? After four years, the Bucs still don’t know the answer. There are times in pass protection when Smith looks like a Pro Bowler. There are other times when he looks like he’s going through the motions. Consistency is not a strong point, and that simply won’t do for this new coaching staff. When run-game coordinator Harold Goodwin drills down on Smith’s tape, he’s not going to like what he sees in terms of physicality. Run-blocking has been a challenge for Smith and he’s been part of the problem for a ground game that went nowhere during Dirk Koetter’s 3-year tenure. The real question remains: can the Bucs do better? Probably not in free agency. Teams aren’t in a hurry to let quality left tackles test the market — where all it takes is one suitor with deep pockets. One way or another, Smith is going to get PAID in 2019. He’s probably looking for roughly a 5-year, $65 million deal, and if the Bucs feel that price is too high, Smith will find a new landing spot. With the No. 5 pick in the draft, the Bucs could decide to move on from Smith and choose a younger, cheaper replacement. ESPN draft pundits Todd McShay and Mel Kiper Jr. each have the Bucs grabbing Alabama left tackle Jonah Williams in Round 1. 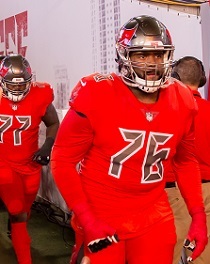 WalterFootball, a respected draft site, predicts the Bucs will take Florida offensive tackle Jawaan Taylor, who projects more as a replacement for Demar Dotson on the right side. Deciding Smith’s fate is a huge priority for this franchise. He could be a free man in four weeks. 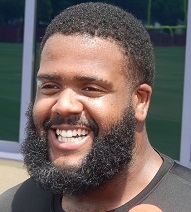 They could decide to pay Smith and upgrade elsewhere up front, especially at right guard, or the Bucs could begin their offensive line overhaul by letting Smith test the market place. Yes, he’s durable, but after 64 starts, Smith still remains a below-average run blocker. It’s difficult to build an elite line with an average left tackle, so Smith will have to elevate his game no matter what franchise he’s representing next fall. 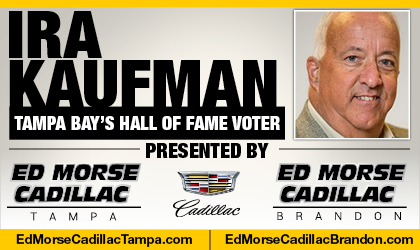 The verdict on Smith will go a long way in shaping Tampa Bay’s draft board. If Smith stays, the Bucs won’t feel nearly as much pressure to select a tackle in the first round. If Smith departs, Jonah Williams will cast a massive shadow on Tampa Bay’s selection process. Entering his fifth pro season, Donovan Smith remains a 6-foot-6, 340-pound tease of a football player. No way you pay this guy $12 or $13M per on a long term deal. Nor $15M for 1 year either…. Wester and/or Liedtke will do just fine for 1/10th the price. Either would probably be an improvement for the run game actually…. Let some other team grossly overpay Smith only to wish they hadn’t. Bucs will net a nice comp pick the following year in doing so…. Jonah Williams is a technically refined offensive tackle who projects most favorably into a physical offensive front. Williams’ pass protection skills would be best utilized in quicker passing schemes to protect his lack of length from being exposed on deeper pass sets, but that’s no reason to dismiss his skills as an offensive tackle and move inside to guard. Should be a rookie starter at the NFL level and provide quality play on the outside by the end of his first year. Great article Ira, you’re on fire this morning. Personally I don’t think it’s as big a dilemma as most seem to think it is, primarily because we’ve really got THREE HOLES on our OLine as of this moment (LT, RT & Guard). Dotson, Evan Smith, Cappa, Wester & Liedtke MAY be acceptable backups, but I’d hate to go into the season with any of them as a starter. So the question IMO becomes ‘How do we fill THREE OLINE HOLES with quality starters in just 1 year with limited salary CAP space?’ Do we use a high draft pick? Do we re-sign Donovan? Do we sign some other FA OLineman? To me the answer is YES – YES – and YES. First I’d franchise tag Donovan & see how eh does this year with a new coaching staff (probably cost us $14-$15 mil). Then I’d sign a quality veteran (older) starter in FA who’s versatile enough to play Guard or RT (probably cost us $5-$7 mil) as a ‘bridge’. More than likely the Bucs will have the opportunity to trade down in the 1st Rnd & pick up an additional 2nd Rnd pick. I’d use the 1st Rnd pick on OT’s Jawaan Taylor or Andre Dillard, then let them battle it out with Donovan for the starting LT spot in preseason (the ‘loser’ plays RT & serves as a much-needed LT backup). That’d still leave us two 2nd Rnd & one 3rd Rnd picks to use on defense. Pick up another OLineman in the 4th to develop. Anything after that is a crapshoot anyways. I didnt even have to get past the first two sentences. An ironman left tackle whonhas never missed a game and is ranked average with nothing but bad coaching since being drafted should be exoected to improve with good coaching. or been durable enough to last a full season. IMO the best bridge players we had were gifted to us in trade because other teams could no longer afford them. and Smith alone on offense. infusion of talent on defense. So has pass blocking. And motor. Move him to guard, Ali to the right side, where he excelled as a rookie. That takes care of one of 3 positions. Between Cappa, Leidke, and Wester, you should be able to fill at least one of the remaining tackle spots. If the LT of New England’s has time on his contract, trade for him now! Best move for Smith is a franchise tag…. I’m not sure if that cut off has passed???? Smith has always had lazy work ethics but that was his knock from college but his upside was way too high for the bucs to pass. The Bucs should draft a tackle…. But who knows cause corner is more of a need and I see the bucs trading back for more picks….. I think alot of OLine issues were previous regime coaches. Smith seemed to perform well in run blocking his rookie year when Mankins was basically the OLine coach. Franchise Smith for one year, Draft Yodny Cajuste our of WV in the 2nd. Tough decision, problem is you don’t really know what you’re getting in free agency. You overpay for guys then realize later that they’re not as good as you thought. He had Warhop as coach and..Warhop really didn’t do anything ? Got to see what new better coaching can do for him. No different then koetter getting blamed for Jameis. Since Jameis is getting same opportunity …to see what He can do with better coaching under Arians. To tag Smith is a short-term move that one way or another must be dealt with next year. Pretty sure BA plans to stay longer than 1 year. I think the safe thing to do is draft his replacement now. If he pans out and is signed to a long-term deal, RT Demar Dotson is on his last legs and will need to be replaced. Anthem, Feb 19th is the first day franchise or transition tags may be used. 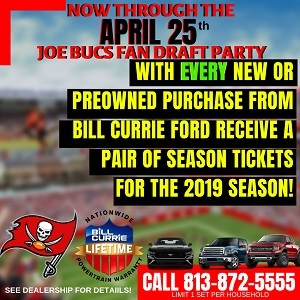 Teams have until March 5th to decide whether to use – same week Bucs have in the past have started announcing player cuts. Free Agency begins officially March 13th. you make a great point….. I agree macabrr transistion tag woukd be the route I woukd choose as well. Transition is the best way to determine Smith’s worth. On another note, Freddy Martino is playing for the Arizona Hotshots of the AAF. If you had Tom brady….Rodgers….Mahomes or basically any QB that gets the ball out quick, then Smith would be adequate but Winston is none of those. He holds the ball too long, has a slow wind up, doesn’t check down and is turnover prone. The Bucs have to get a stud for Winstons blind side and one that can run block. Those are two must for Winston to make any strides forward. If you keep putting him under pressure, he’s going to keep attempting to make plays which from a stats perspective, is going to lead to turnovers. With Donovan he has the physical attributes to be dominant but his problem is above his shoulders, his passion his drive. Maybe BA and Co. can tap that. Tag him and draft trenches. Fix the trenches, watch this team take off! Yeah because Winston designed all those 7 step drop long developing plays. Before you thought he was stupid now you think he designed Koetter’s play book. Pick one because now you just sounds like you’re just trying find ways to blame Winston in every article. I know they all can’t be like Macabee but there should be a minimum standard. Great points Mac. The frustrating thing is we all know Donavan has got the talent to be a top LT he just needs to work harder and be more consistent.